Re-evangelizing New England: How church-planting and music festivals are bringing about a quiet revival. How church-planting and music festivals are bringing about a quiet revival. New England used to be one of the churchiest places in America. Can evangelicals convert the secular natives? In 2006, Warren moved to Vermont to open a new Baptist church in a town whose last church had closed its doors the year before due to lack of attendance. His congregation, which meets in the closed church’s old white clapboard building, grew slowly but steadily, and in early September, Warren opened up a second new church in a nearby town. Similar churches have sprung up throughout the region: New England has become a mission field, and there are seeds of a revival sprouting. 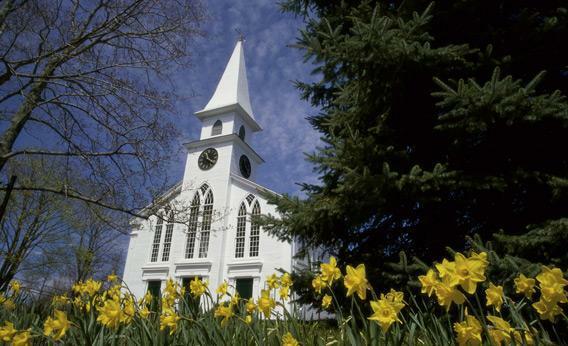 The Northeast is the historic cradle of American Christianity, and just about every postcard-ready town here boasts a white church with a steeple. But sometime between the Second Great Awakening and today, the region evolved into the most secular part of the country. In the words of one regional missions group, “pulpits that once boasted gospel preachers like Jonathan Edwards and George Whitefield now proclaim universalism, liberalism, and postmodernism.” A Gallup poll this year found that the four least-religious states in America are in New England. For evangelicals, the issue is more pointed: Evangelical researcher J.D. Payne has found that of the five U.S. metro areas with the lowest percentage of evangelicals, New England cities are beat only by Mormon-dominated Provo, Utah. New England is relatively wealthy and educated, and overall, its population is shrinking and aging. That’s why some Christians see New England as “hard soil”—and desperate for re-evangelizing. There’s a palpable sense of momentum growing among evangelicals in New England, who say this hard soil may soon bear fruit thanks to institutional efforts, individual leaders, and an intangible sense of energy often credited to the Holy Spirit. But do they have any hope of success in the most proudly and profoundly secular region in America? The movement to convert New Englanders looks something like the recent evangelical focus on Western Europe, another traditionally Christian region that is now broadly unchurched. One popular approach is “church planting,” in which a pastor moves to a new location to found a new church that he hopes will eventually spawn several others, and so on. Because the method eventually produces indigenous churches, it’s considered a more reliable and organic path to growth than traditional “outsider” evangelism. To generalize broadly, church-planters tend to be young and Web-savvy, are almost always male (with a supportive wife), and often share a conviction that orthodox theology needn’t be burdened by the trappings of traditional worship. Think overhead projectors, not organs. Stephen Um is pastor at Boston’s Citylife Presbyterian Church and a leader in the movement to re-evangelize the region. Born in Seoul but raised and educated mostly in Massachusetts, Um founded his church just over 10 years ago with a base group of 12 people. Citylife now meets in two locations in Boston, including a hotel conference center on Boston Common, and attracts between 700 and 800 people—a highly educated congregation that’s about one-half white and one-half Asian—every Sunday. Um calls what’s happening in New England a “quiet revival.” He speculates that since the drivers of the revival are small churches spread throughout a largely rural area, it doesn’t get the kind of media attention that megachurches attract. Um is also the founder of the Center for Gospel Culture, which he calls a “catalyzing center” for mobilizing and recruiting Christian leaders in the region. The group hosted a regional conference in October with the Gospel Coalition. The event was designed “to encourage the development of this organic gospel movement.” The 1,200-person-capacity event space he reserved sold out by mid-September. The event drew representatives of about 270 different churches representatives from about 40 networks and denominations. Not all Christians in New England welcome the movement with open arms. Emily Heath is pastor of West Dover Congregational Church in Vermont, which she describes as progressive and egalitarian—just the kind of place that some fear is insufficiently orthodox. Heath says she sees “a growing undercurrent of fundamentalism in New England,” and it bothers her to see her own thriving church characterized as lifeless by local conservatives. “I’ve read that on their websites, and it’s like, Huh, my church feels pretty alive. We’re growing.” On Easter Sunday this year, an evangelical church-planting team from Atlanta opened a new church the next town over. And after all, the work of spreading the gospel is not new here. The royal charter of the Massachusetts Bay Colony, drafted in 1691, states that this was the very purpose of the colony: “to win and incite the natives of the country to the knowledge and obedience of the only true God and Savior of mankind, and the Christian faith.” As some new New Englanders see it, that’s even more true today. The question is how the natives will respond.